Columbus Ohio –When Michael Showalter’s parents asked him to earn money toward college, they had in mind an after-school job. But Michael started a small business, Guiseppe’s Italian Ice, which quickly turned a profit. He then used his business’s success story to win the McKelvey Foundation’s $40,000 college scholarship, awarded to student entrepreneurs. Guiseppe’s Italian Ice operates out of pop-up tents, dishing up traditional Italian Ice to tired, thirsty fairgoers at festivals and outdoor events. Showalter buys the product from Little Jimmy’s Italian Ice in New Jersey, where it’s manufactured according to a century-old family recipe. “It’s healthier than most desserts, especially stuff that you find at a festival. One of the reasons I sell this brand is it does not have high-fructose corn syrup,” said Showalter. Popular flavors are lemon, blue raspberry, watermelon and cherry. 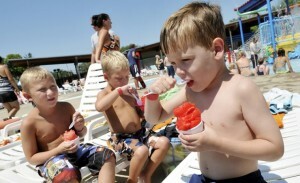 From time to time, the menu also features pina colada, chocolate, grape and green apple Italian ice. His enterprise, named after his father, began a year ago with an initial investment of $14,000. He recouped those startup costs handily, and in fact, broke even. Soon, Giuseppe’s began adding employees. With eight workers and two tents, Showalter has invested another $20,000 to expand his market–next year, Giuseppe’s Italian Ice will be sold in both Ohio and Michigan. Like most entrepreneurs, he is constantly expanding his funding horizon, and never shies from opportunity. The McKelvey Entrepreneurial e-scholarship could have been designed for Michael Showalter—it was created in 2006 to relieve the burden of debt many students face after graduation. The Entrepreneurial Scholarship is offered by the McKelvey Foundation to high school students who start their own businesses or nonprofit agencies. The foundation’s founder is Andy McKelvey, who started his own first business selling eggs at age 14, and went on to found several successful businesses, the largest of which evolved into the online employment ad giant, Monster.com. The McKelvey Foundation currently supports over 600 students achieving a better future. Showalter graduated from high school this year, and isn’t yet sure what his major will be at the University of Michigan. But he is sure about how he’ll earn his income–he’ll continue selling Guiseppe’s Italian Ice at festivals, fairs, and public events. There are many more resources about entrepreneurial scholarships when you do a search in Google. Our Push carts are a Miracle on Ice! Just Fill with Little Jimmy’s Italian Ice and You’re Good to Go! Italian Ice is a dessert treat that has been around for centuries. Little Jimmy’s Italian Ice recipe consists of a water-based, fat-free, dairy-free, cholesterol-free, and high fructose corn syrup-free gourmet dessert of many different flavors. Little Jimmy’s Italian Ice is a true Italian water ice which has the creaminess of sherbet or ice cream and never contains any dairy or non-dairy creamer. Our Italian ice is produced the old fashioned way in Elizabeth, New Jersey. Italian ice Pushcarts, concession trailers, trucks and kiosks are available. Our Italian Ice recipe has remained unchanged for nearly 75 years. Little Jimmy’s Italian water Ice is sold at malls, stadiums, amusement parks, festivals, fairs, beaches, flea markets, camps, state parks, swim clubs, golf courses, resort hotels, carnivals, zoos, etc… At these locations our water ice is sold from Italian ice push carts, concession trailers, kiosks, freezers and concession stands. In fact, anywhere there is a gathering or flow of people, there is an opportunity to sell Little Jimmy’s Italian Ice.